The Pulitzer prize-winning newsman's analysis of Kennedy's ideological journey toward "increasing radicalism" and a personal account of his subsequent successes (and single major defeat) along the campaign trail. 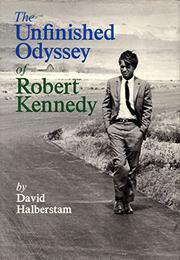 Halberstam shows how Kennedy in his role as "leader of the honorable opposition in the Democratic party" became the caustic critic of the administration's ghetto policies as well as a more cautious critic of its Vietnam policy, placing himself at "the exact median point of American idealism and American power." It is a fascinating story of realpolitik (the Kennedy staff wanted Mayor Daley's backing in Chicago) played for radical aims, but Halberstam demonstrates his thesis that Kennedy was the rare politician who surpassed his image. The Kennedy backers were a coalition of old eggheads, youngish radicals (Allard Lowenstein was a major booster and a radicalizer of the candidate), veterans like Larry O'Brien, and--possibly--because he was the first, candidate to visit them and make demands for them--the ghetto residents. Kennedy was a crucial bridge to the New Politics which was, like the country, "in transition politically." Halberstam mourns him.